The Forbidden Woods - View topic - Overworld size? I'm currently designing an overworld for a game and can't make up my mind on whether or not it's too big. I figure having some differing opinions on its size could help me make up my mind one way or the other, whether by taking people's advice or actively defying it. 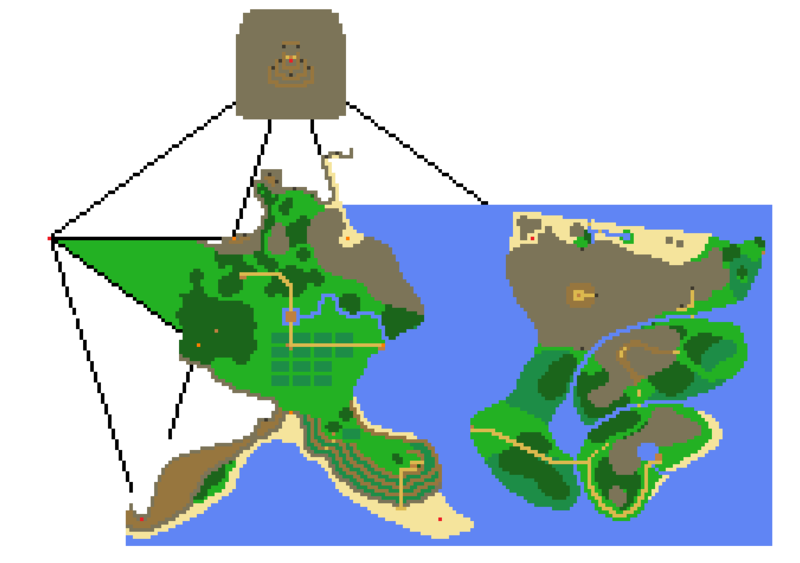 The game is intended to be big, but I'm wondering if that's too big; I've already decided on shrinking the main island taking up the majority of the overworld, but if that still is too big I should just reapproach the design from scratch, and I kinda want to get myself decided before putting too much work into it. What do you mean that it's 'too big'? Is it slowing down your game, or do you think it's aesthetically too big? I think you should make it as large as you think you need and shrink (or grow) it only when problems arise that require it to be a different size. Well, one factor that immediately comes to mind is workload. A main mechanic of the game is that every tile sends you to another room, similar to Zelda II; however, where Zelda II only had a few select rooms you were warped to, depending on the environment, this game would have a unique room for every tile on the overworld. But also, game feel needs to be taken into consideration; while the overworld needs to have a feeling of expanse to it, it can't feel barren, so a balance needs to be struck in the size that leaves the player feeling like they're in a grand world without them spending too much time between destinations (should they stick to direct routes). I think it looks alright, though if you want to shrink the mainland a little, it would still look great. Perhaps an underground civilization, or mention of areas the player can't access? I think the key to a feeling of being in an expansive world is a variety in locations and settings, as well as comments about places you can't go to (or if you do it won't be soon) and little areas open for exploration. If the world can't be physically huge, then make the most of what you have. Look at older games and see how they dealt with making their worlds feel big. That's all I can think of. Additional input I'd like is how clear it is that the southern peninsula is a terrace farm, and that the center area is farmland. You can also see that the castle town beyond the farmland, which is further surrounded by heavily forested area, followed by a mountain range. 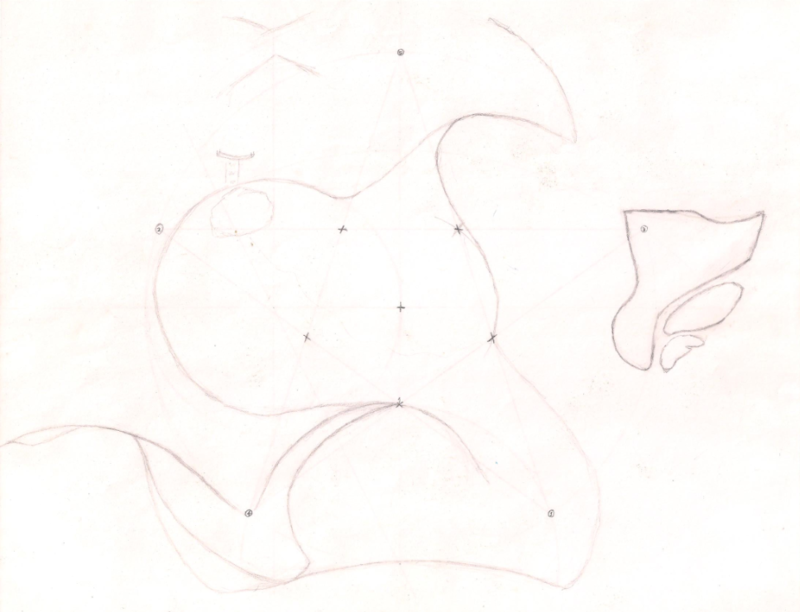 In the area that's currently just a green triangle, there'll be a lake situated between the forest and the mountains, and hidden in the mountains will be a secret valley, as crudely illustrated in the sketch-up. This reminds me of The Adventure of Link. Anyway, I think that the terrace area is pretty obvious (or that you really can't make it more obvious, take your pick), but the farm needs a bit of work, such as some one pixel vertical lines in each block or something like that to indicate that it is indeed farmland. More or less that's because that's what people think farms look like in 3D overlooks, not because farms always look like that. I won't comment on the rest, because I realize a lot of that work isn't done yet, for the most part it's looking good, I think.